Can the Rally be Trusted? Article originally appeared on October 20th at www.HorsesMouth.com. After a solid market rally, sentiment seems to have changed from financial Armageddon to Rally Time. But is the exuberance warranted or irrational? Looking at Chart 1 below of SPY the SPDR’s S&P 500 ETF, shows reason for caution as we go forward. Even though the markets have regained positive territory on the year (10/14/2011), a look at SPY clearly shows that we are only at the top of the trading range that we entered in August. A peak that we have seen equaled twice before, only to be turned back on negative sentiment. So is this time different? The one thing to consider as we hit resistance is that in each of the past instances the market has schizophrenically bounced back and forth between resistance and support based on the news from Europe. Last week was very quiet on that front, and news centered on the U. S., specifically earnings. So for a minute, let’s assume that the big Europe bailout comes through and all is good in the (financial) world once again. Is a rally through resistance warranted by U.S. fundamentals? 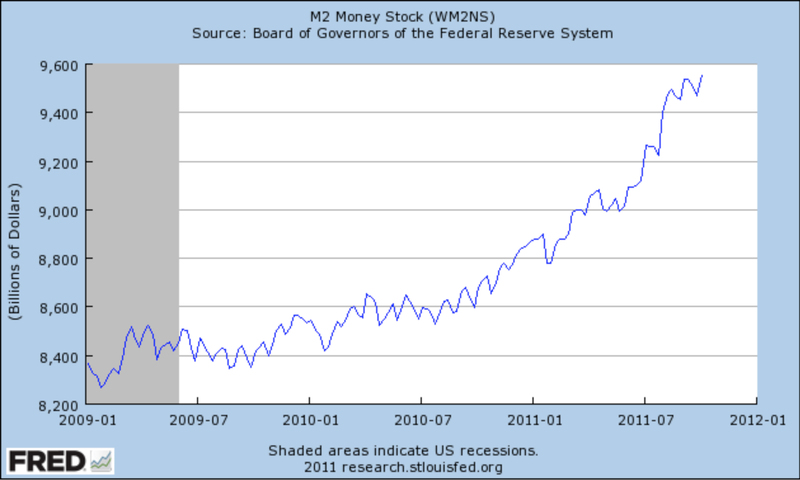 The most worrisome evidence to the contrary comes from the St. Louis and Chicago Federal Reserves. The KC Fed publishes a monthly Financial Stress Index and the Chicago Fed a National (business) Activity Index. The two are shown in Chart 2 along with recent recessions in grey. The indices have longer track records and details can be found here: pdf download and pdf download. To sum the Fed literature, the two indices when taken together have predicted the last 7 recessions. 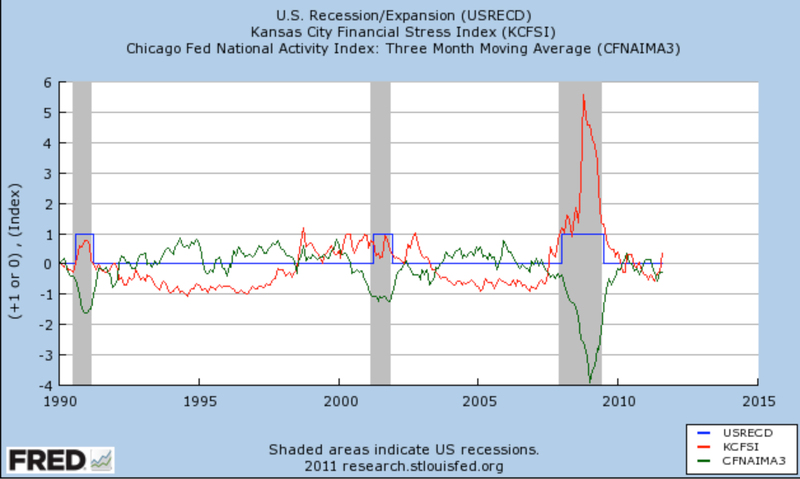 The indicator is when the KCFSI is positive (indicating above average financial stress) and when the CFNAI 3 month moving average is below -.7 we have had a recession. While the CFNAI is not quite there yet at -.43, what is troubling is that a positive KCFSI will drag the economy into a recession if it stays positive, as it did in the late 90’s and early 2000 before the CFNAI dropped to the -.7 level – at the start of the 2001 recession. 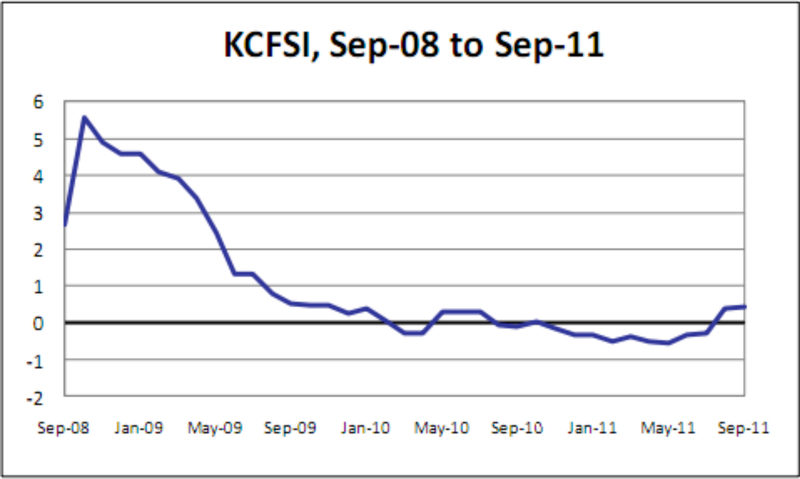 Currently the KCFSI is heading into positive territory with a September reading of .44, up from .37 in August, as seen in Chart 3 below. 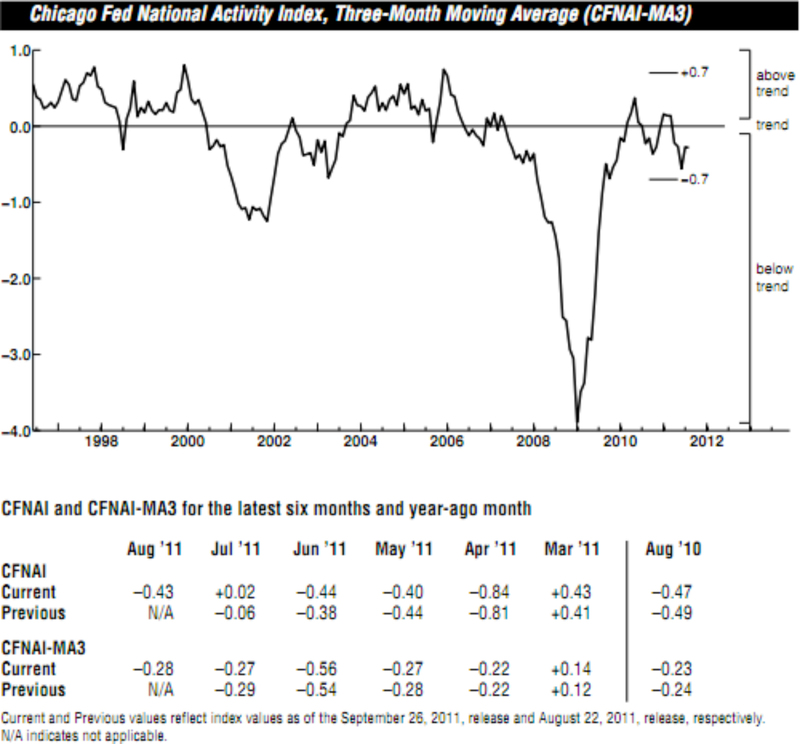 Simultaneously the Chicago Activity Index is in negative territory, showing a large slide from July over August as seen in Chart 4 below, from +.02 to -.43. However the 3 month moving average was virtually unchanged. The September data is due out October 29th. Clearly, the data from these two indices show that the U.S. economy is on the ropes, all by ourselves, without an implosion over sovereign debt in Europe. Unfortunately the Chicago data is about a month and a half old, and although the Kansas City data is fairly fresh let’s look at some more recent fundamental and technical data. The first is the Economic Cycle Research Institute (ECRI), which has already announced that we are in fact in a recession. From the N Y Times, “Relying on a series of proprietary indexes, the institute…Over the last 15 years , has gotten all of its recession calls right, while issuing no false alarms.” In other words things are about to get worse, giving added gravity to the St. Louis Federal Reserve and the Chicago Federal Reserves’ Indexes. Using the logic behind combining the two Fed indexes- that financial conditions govern economic activity, let’s look at some other financial indicators. Using JNK, the SPDRS Barkley’s High Yield Index ETF as a proxy for the spread between low and high rated corporate securities, clearly JNK has been in rally mode for the past week. However, unlike SPY, while it has re-entered its trading range, it has yet to push up to its resistance level. Next, in Chart 6 is XLF, the SPDR Financial Sector ETF. Again, while it has regained its trading range, it has not followed the broader market up, to challenge its resistance level. I’ll finish this series with VIX, the CBOE Volatility Index ETF. While it has –barely, broken through support, it is still well above its range from the beginning of the year through July. Volatility is not consistent with healthy markets. Then there are a couple more fundamentals indicators to look at. First is the TED spread which shows the difference between the 10 year Treasury and the LIBOR rate. As the spread widens it shows that banks are charging a higher premium to lend to other banks. Clearly from Chart 9 below, banks faith in other banks credit worthiness is declining, not increasing. 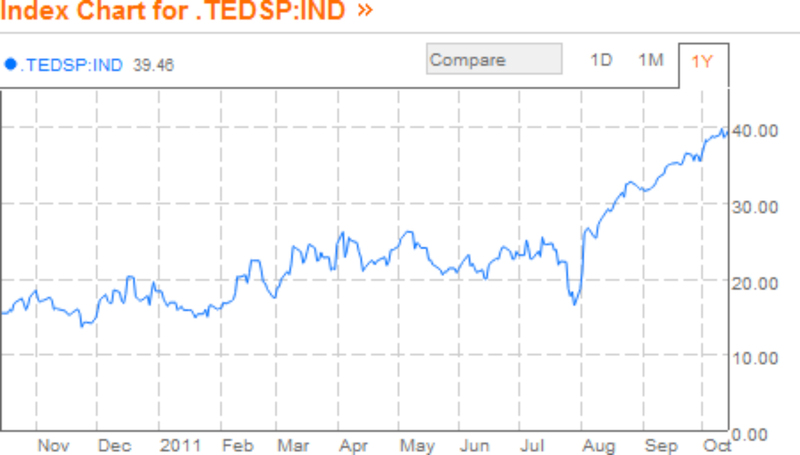 The TED spread is an indicator used in the KCFSI, so this does not bode well for the next release. The next Chart shows the level of M2, which skyrocketed in July – August during what, so far, has been the peak in pessimism over the European sovereign debt crisis. While the climb has paused over the last month, the overall level has continued to climb higher. The common explanation is that money has fled Europe and has been deposited in “safer” U. S. banks. My investment thesis has been that the U. S. market would live or die with Europe. If Europe can pull itself together and stave off a major crisis, the U S markets would rally based on solid corporate earnings and balance sheets. However, the data outlined above is painting a different picture. With Europe out of the picture for a week the markets did in fact rally – but so far, are still within their trading ranges. In fact key sectors, High Yield Bonds and Financials have yet to pressure their upside resistance levels. The VIX is slightly below support, but well above levels we saw in the first half of the year when the market did rally. Fundamentals concur. The ECRI and the Federal Reserve generated KCFSI and CFNAI, all have accurately predicted recessions in the past. While the Fed indicators aren’t quite at recession levels yet, more current date like that from the ECRI and the TED Spread do not provide much room for optimism from future releases. While any rally is welcomed, this is definitely one to be wary of. While I still expect a significant rally if we get good news from Europe. 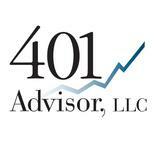 For it to last we need to see a market turnaround in many fundamental indicators.